Docks Slips For Sale and Rent - Dock for Sale in Florida FL, GA, SC, NC and Dockominiums! SCROLL DOWN here to find some of the best deals in Miami, and the south Florida area, on boat slips and docks for rent, and slips for sale. Please do not submit "Slip Wanted" Ads. Aventura/North Miami Dock for Sale - 75' X 20' Slip, with custom (permitted) pier extension.It is on the south side of the marina closest to parking and the beautiful Waterways shopping plaza as well as seven restaurants and a Bally's gym. Liveaboard ok, water, electricity, phone, security, hurricane safe. $250,000 Call 305-466-1715. Coral Gables 40 ft. Slip for Sale - Excellent Location, 24 hr. security. Full time dockmaster, fuel delivery, pump out station. No bridges to Biscayne Bay. Call Art 305-975-1088. Harbour Cay Club Slip for Sale - Marathon, FL Keys. 62 ft dock for sale, liveaboard ok. Water, electricity. Visit www.HarbourCayClub.org for location info. Email the owner at threekeys@yahoo.com $400,000. Grand View Palace - 35 ft. Miami Boat Slip for sale. Grand View Palace Yacht Club, North Bay Village, Miami, FL. Parking, pool, club room, water, electric, non-live aboard. $72,500. Call 786-236-5438. 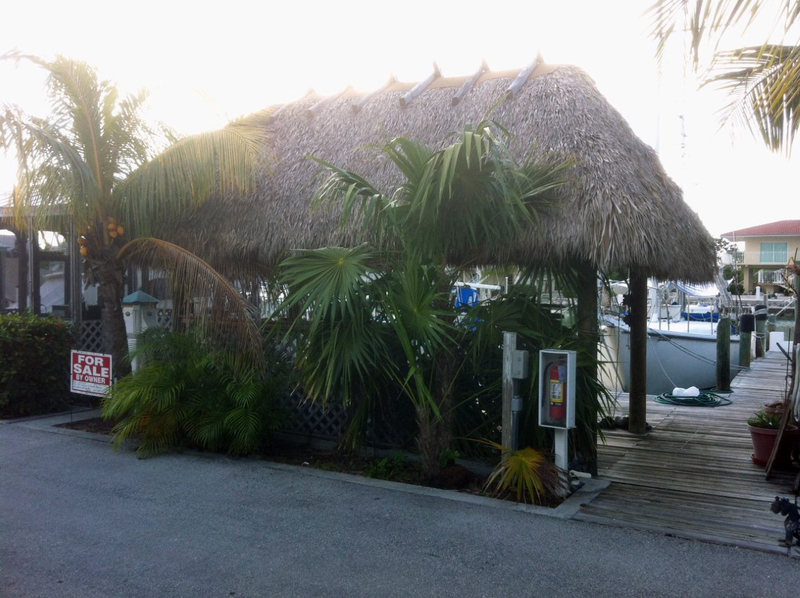 40ft x 16ft dock for sale - Grand View Palace Yacht Club in North Bay Village, Miami, FL. Great location with no one in front. Dock assoc. only $162 and is totally seperate from condo assoc. Great investment. $78,000 Please call 786-942-6625 for more info. 90'CONDO/DEEDED SLIP FOR SALE - Deering Bay Yacht Club Marina, Coral Gables,Fl. by owner/agent. Slip 15. Protected slip in gorgeous marina off Biscayne Bay. Deering Bay Yacht Club Marina is off scenic Old Cutler Road in Coral Gables and is part of a larger million dollar condo development. The slip has adjacent gated parking providing easy access for fuel delivery and maintenance. Slip is concrete 90'X 33'(+10%overage permitted)24 hour security protection, 10 minute access to Biscayne Bay, Atlantic Ocean and Florida Keys. Protected from storms with its position well inland and surrounded by large condo buildings. Great area for fishing, sailing, skiing, boating and family fun. The setting encompasses a private, peaceful and serene atmosphere not matched anywhere else in South Florida. Non-liveaboard $895,000. Call 305-665-7996, 305-282-9541 or email silviamillor@aol.com. Hilton Head, SC slip for sale. 58 X 20 floating concrete dock, 8' low tide. Secure ICW marina. Fuel,pumpout, haulout, wifi, cable TV. Ocean 20 minutes. Class A inlet.$119K 941-639-1611. WHY PAY RENT ??? Two boat slips for sale or rent at Grandview Palace Marina. Electric, cable, water, security, fitness center, non-liveaboard. 79th St. Causeway, Miami, FL. Great location, great price 60 FT $90,000.00, 90 FT $135,000.00 Owner will consider finance. 90 FT $135,000.00 Call Jorge at 305-804-1544. 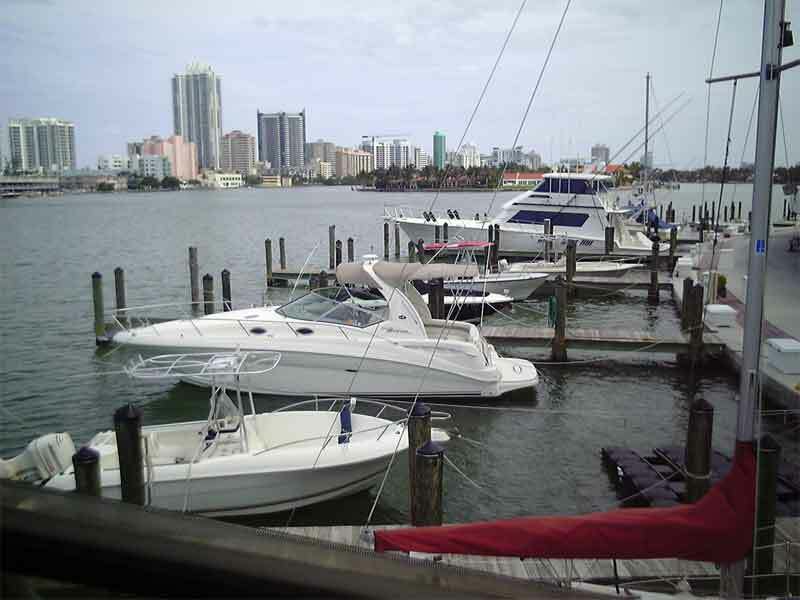 Grandview Palace yacht club 30x16 in water slip, full time dockmaster, concrete pier, dock assoc., fitness center, marina lounge, located between Miami and Miami Beach. $45,250 Call 305.522.4359. Non-liveaboard. Miami Beach Dock for Sale - 65ft x 24ft concrete dock in upscale Sunset Harbour Yacht Club in Miami Beach. Just minutes from Lincoln Ave and beaches. Hurricane safe with all amenities. NO PROPERTY TAX. Owner may finance. Liveaboard OK. Price: $350,000.00. Contact: Estelle Cockcroft, 20533 Biscayne Blvd., Unit 918, Aventura, Fl 954-249-9764. To see the marina website visit: www.sunsetharbouryc.com. RiverRun Yacht Club, 40 Foot Deeded Slip located in the Miami River next to the 17ave Bridge. 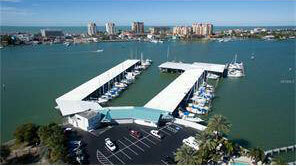 This Marina offers excellent protection during approaching storms, Internet viewable security cameras 24/7. Water & Shore Power. Liveaboard OK. 305-244-5799 $95,000.00. North Miami - Haulover Area - Up to 60 feet at Private Secure Condominium just off Route 1 in North Miami. Easy quick access to the bay and just acreoss from Haulover. Two marinas with fuel on the street, lots of restaurants nearby. 2370 NE 135th St., North Miami, Florida Call 305-948-6618. 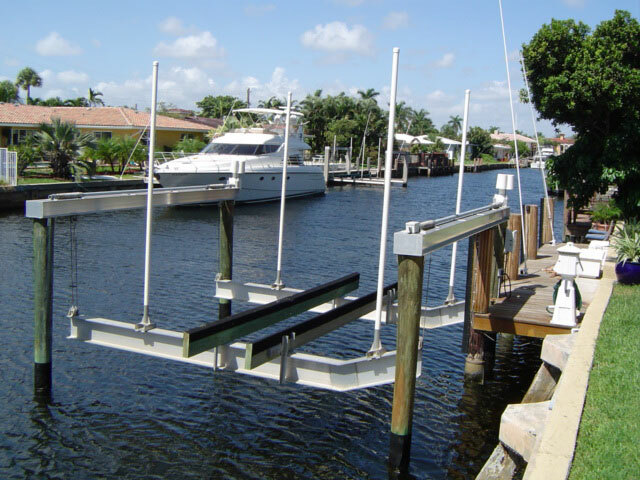 Dock for Rent in North Ft. Lauderdale - Put your boat in a secure area and out of the water: High, Dry, Clean, and Secure. This wide canal dock space is available for a boat that weighs up to 24,000 lbs. There is water and shore power available as well with this premier location. Located five houses in from the East side of the Intracoastal, 1 mile north of Commercial Blvd, no fixed bridges, minutes to Inlet, etc...No liveaboards please. $595 per month. Call Patrick 561-445-3332. The best location for your boat. Big, 67' deep water slip with easy ocean access. Monthly lease includes use of the slip, 50/30 amp power, water, and private parking space. Well protected from any wakes and very secure. Several of Miami Beach's top restaurants are within walking distance, and the beach is a 10 min stroll. The marina is attached to a private luxury condominium in the neighborhood of North Beach and is ideal for total privacy with easy access to all Miami Beach activities...day and night. Bring your big boat! 18/ft [$1000 minimum] Please call (913)991-0450 or baydrive@mac.com. No sailboats. St Petersburg/Tampa - Free dock/maintenance for light use by Master Captain. 5 min. to Johns Pass and Gulf. Up to 52 ft power or sail.Beam up to 25ft ok. Contact Bill Ross 727-412-3744. Non-liveaboard. Water, Electric & Security. Dania Beach Cut off Canal, No Bridges, water and electric, Private Home, off road parking, easy in and out, close to intercoastal and inlet, 1st. Home in off main canal. Deep water, storm cleats. $900 (908) 377-8182 New Dock, Safe Area. 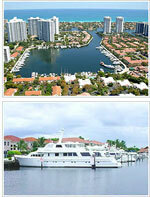 North Bay Village, Miami - 30'x16' deep water slip, gated concrete docks, daytime dockmaster. $300 305-970-1867. Dock with Boat Lift - King Fisher Canal 10000 lbs boat lift plus whip dockage. Non-liveaboard. $10/foot. Up to 43 ft. Call 954-426-9194. 55ft slip seasonal or annual Singer Island. From $800. Non-liveaboard. Call Tom 904-461-9557. Fort Lauderdale Dock for Rent - Laudederdale Harbors. Up to 60' boat. Water and electricity. NFB minutes to ocean. No liveaboards. Behind house. 954-444-6782. Boat slip for rent on Gables Waterway call 901 680-9692 $700/mo non-liveaboard. Gables Waterway Dock 4 Rent Deep canal, easy ocean access, non-liveaboard, $400/month. 305-216-2642. 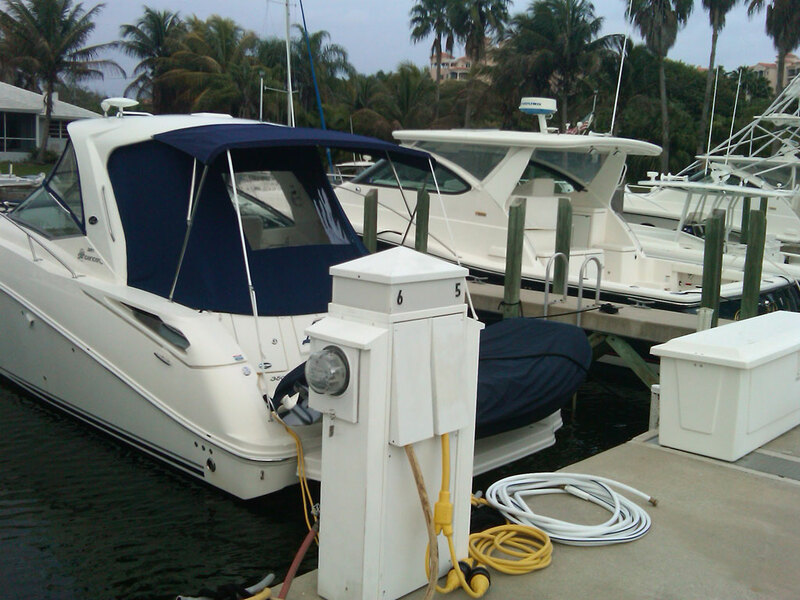 Waterways Marina N. Miami, hurricane protected, 5star, liveaboard 55 & 75 ft. $900 305-318-3900. FT. LAUDERDALE DOCK FOR RENT - 50' deep water dock, wide canal off the New River, no fixed bridges, located behind private residence water and electricity available. No liveaboards. Cleaning and general maintenance negotiable. $12/ft. of waterfront. 954-530-3800. 55 FT YACHT SLIP, MIAMI BEACH LUXURY YACHT CLUB, Full Service Luxury Yacht Club located in the heart of Miami Beach. A full array of amenities to make living and boating easy. 24 Hour Dock Attendants and Security, Waterfront Olympic Pool, Fitness Center, Covered Parking, Dock Side Gas Delivery, Hook Up for Cable and Utilities, Washer Dryers and Shower Facilities. Perfect nautical location, 1 Mile from Government Cut, no fixed bridges. Walk to the internationally reknown Lincoln Road Shops, Cafés, Restaurants, Cinema and Entertainment. Stock up on groceries at the full service grocery store one half blocks away. Email rbh127@aol.com for monthly, 6 mo. and annual rates. 60 FT DOCK SPACE ON THE MIAMI RIVER - 30 ft available immediately, with a potential of an additional 30 ft if needed.Hurricane-safe dock includes water & electricity. ( No live-aboards) Only 30 minutes from the Ocean & Biscayne Bay. Enjoy the secluded, lush, tropical garden and the great price. 3 month minimum. Call 305 439-6625. Sailboat Dock for Rent Ft Lauderdale - 14th street, south side, bow in, 6' draft, light, elec, water, short term. please call 561-543-8226. Non-liveaboard $400/month. Manatee Bay Club, Key Largo Dock for Rent - Beautiful gated dockaminium with pool, jacuzi, laundry, and more. 48' slip on end with large turing basin. Parking next to slip. On US 1, three miles before Jewfish Creek Bridge. Electric not included. 6 month lease. $610/month. Contact: Ed 954-921-7470 Email: edr2d2@aol.com. Dock for Rent Clearwater, FL - Deep water 6-8' draft 17.5' X 55' wood planking along side 25'. Actually, next to Clearwater Beach Yacht Club! One of two large docks in this section. Quick & Easy in and out to Clearwater Pass to Gulf! Beautiful Studio Condo with kitchen& jaccuzzi tub, balcony w/ waterviews available with slip for additional fee. Includes: water, garbage, heated pool, gas grill, patio,walk to lots of excellent dining. Pet-friendly. $525/month. Call 727-441-8445. 60' dock space for rent in Palm Coast FL - deepwater, no fixed bridges to intracoastal, large sailboat or trawler. Non-liveaboard. $300. Contact: Peter at 305-931-4133. Aventura Mystic Pointe Marina Slip for Rent, Aventura, Fl. 50 foot Floating Boat Slip. SECURITY. Easy access to Ocean. Non-liveaboard, electricity, water, and phone available. $1,000 Contact: Maria Alvarez 305-333-7071. New Port Richey, FL WET SLIP FOR RENT. Brand New, Deep Water, No Bridges, New Port Richey (Tampa Bay) Gulf Landings area. water and electricity included. $330/ month. Non liveaboard. Call for info 727-641-9826. Hilton Head, SC Dock For Rent - Hilton Head secure 60 x 20 long term in gated community $720 month. Non-liveaboard. Email me at rtfnpt@yahoo.com or call 860-435-9918. New River Slip up to 60 feet, 16 beam, 50amp, capt at house to keep safe and can due maintenance, one canal west of I-95 off of New River, Fort Lauderdale 954 818 9446. Capt. George Non-liveaboard, electricity, water, security. $900/month. Dock for Rent in South Hutchinson Island/ Jensen Beach, FL - Located behind a home on a canal just off the Intracoastal and minutes to the inlet and down town Stuart. No fixed bridges. Can accomodate a boat up to 33' by 20'. Great for a cat. Non-liveaboard, electricity, water. $6.00/ft, minimum $120 Contact: Ed Radin, 207-286-4992 Email: tamarack2@earthlink.net. Ft.Lauderdale Dock for Rent - Boat up to 30'. Ocean access. Fixed bridges from water level is 8'. Water and electric included. $250/ month. Call Michael at 954-444-8579. 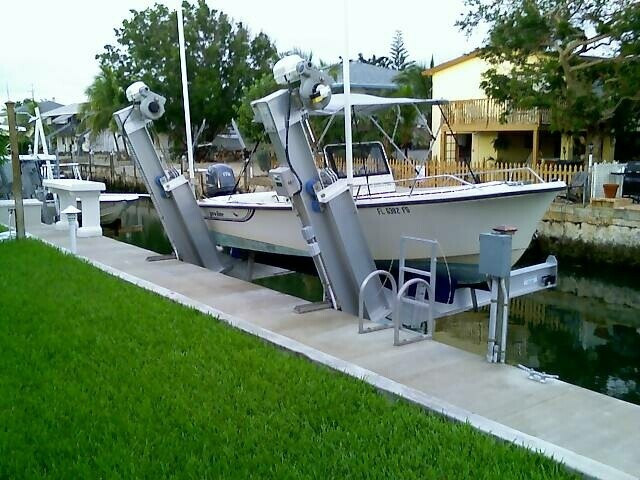 Slip for Rent Jupiter/West Palm area, 70' privately owned slip. Gated marina. Free WIFI, pump-out, water. Liveaboard ok. $900 summer, $1750 winter. Call 561-747-7434 or email: B757flyr@aol.com . St. Petersburg Dock For Rent ($425/month). Dock is located on Harbour Island - Across from Marriot Hotel and St Pete Times Forum - you DO NOT NEED to be a resident of Harbour Island or have access inside the gates.Non-liveaboard. A 14,000 lb electric boat lift, individual storage container with electric hookup, fresh water tap, and public parking Email brian.herzig@hp.com or call 813 785 3293. Deepwater, 51' long, 7' draft and 15' wide. Excellent locations, easy in and out. Lovely small marina with pool (available for slip renter to use!) $600 includes electric, water and cable hook-ups. No Liveaboard, NFB. (Annual lease required). This will go fast, so email sailingnanc@yahoo.com - now! Ft. Lauderdale Dock for Rent - Deep Water Canal, No Fixed Bridges, 26 Ft of waterfront, 18th Avenue (3 miles from Downtown Fort Lauderdale). No liveaboards. Private Residence (Keys to Gate will be given upon rental). Cleaning and General Maintenance Services available upon request. Call 203-982-4946. 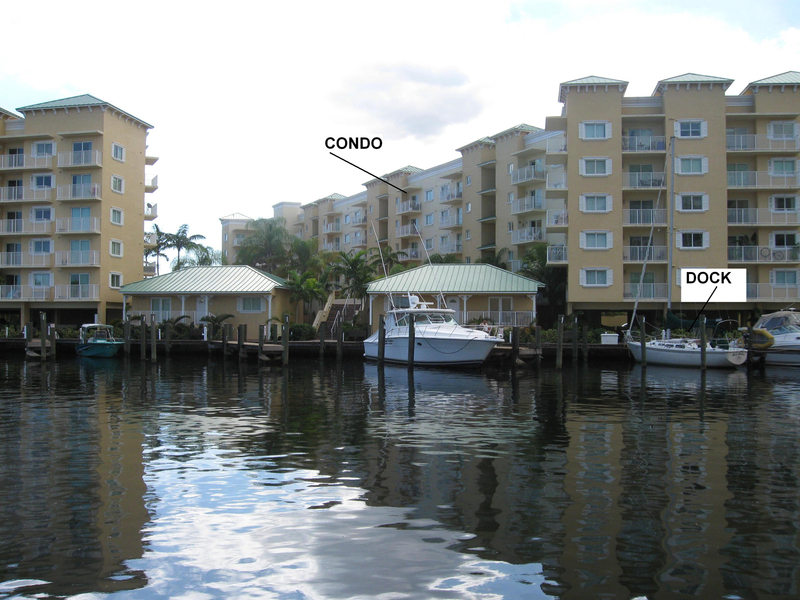 WEST PALM BEACH SLIP FOR RENT - 30 foot wet slip on private 11 slip condo dock with elec., water, and pump out station. Non live aboard only. Well lighted and secure access. Just north of Southern Blvd. in West Palm Beach on the intercoastal. Call 301-343-5252. $350.00 month. 100 ft of boat dockage Harbor Beach, FL - short or long term, easy ocean access/no fixed bridge. Desireable Harbor Beach. Deepest and widest waterway. Liveaboard ok. Electricity, water, security. $1500/month, w/liveaboard extra. Call 954-763-4294 Rosey. Dock for Rent - Oriental Harbor Marina, Oriental, NC. Large catamaran slip available, 40'X 30'X 5.5', up to 45 ' boat. Water, elect, high speed internet available, liveaboard OK. Discount for longer term lease. Dockmaster on site. 772-214-6785. 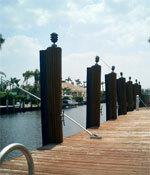 Search here for the best dock for rent, dock for sale & slip for rent, slip for sale in Miami and Ft. Lauderdale!! Dock slip up to 32'. In Coral Ridge Isles, FL (Just a few blocks west of US1 north of commercial). It has fixed bridges. $250 Electric & Water. Call Michael Barone 954-444-8579 or email mph0987@aol.com. LAUDERDALE BY THE SEA - new dock on Extra wide- deepwater canal in Lauderdale By the Sea. Easy access to the Intracoastal. Roughly equidistant to Hillsborough Inlet and Port Everglades. 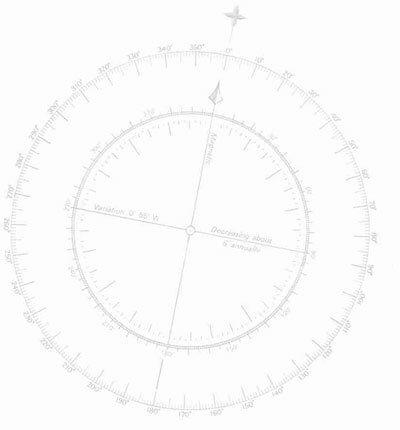 Non-liveaboard, electric, water, hurricane safe. 45ft max., larger negotiable. $20/ft. Contact Tony Capobianco, 484-477-9276. 50ft boat slip location Palm Beach Yacht Haven a private association at Donald Ross & Intracoastal in Palm Beach Gardens, Fl 33401. Gated entrance with security, excellent area of $500,000 + up homes. Liveaboard ok, electricity, water, phone. Excellent hurricane hole 1 minute to waterway. Parking right behind boat. $750. Contact me if interested. Tom 561-762-9255. Ft. Lauderdale's premier location - 8 minutes to the ocean State-of-the-art computerized lift crane system Completely new "hurricane resistant" structure with latest safety, security and professional staff Owner's lobby available with full amenities Rack size: 18.33' H x 15.77' W x 42' L Also includes: electricity, water, wash-down system, climate control $1,550 per month (negotiable). Contact: Richard at 561-488-2502 or email randk12@hotmail.com Posted: April 20, 2006. 40 ft. + Dock in East Boca Raton - Non liveaboard, electricity, water, phone, once in while sleep on is OK . Can accommodate a large vessel. No fixed bridges. 5th house from Intracoastal. Call Lou at 561 504-5753 or Frank at 561 212-0571. Posted: March 5, 2006. 50' Slip available from December 1st to June 1st 2006-2007, $675.00. Non liveaboard, electricity, water, security, floating dock. Mystic Point Marina, Aventura. Call Bobby @ 305-326-9555. Posted: March 5, 2006. MIAMI BEACH NORMANDY ISLE 200 yards to Intracoastal on quiet canal back to private small 2-floor condominium building. Boat slip 27' x 12'. 2033 Calais Drive. $150/month month-to-month. 10% discount for annual pre-paid lease. Non liveaboard, electricity. Call 703-819-7529 or email schahal@yahoo.com . FLORIDA DOCK FOR RENT: No bridges to bay. Month to Month rent available. Call Lynda for more information at 305-333-5819 or email to lynda.anapol@gmail.com . Will consider negotiating monthly price for a boat under 30 feet. Platform for jet ski or dingy and small storage box available. Non liveaboard, electricity, water, security. $450/month. Liveaboard slip for rent, Westerly, Rhode Island. Electricity, water, security, phone, seasonal contract. Club house, showers, stores, Beach, fun parks and right on the New London river in CT. $60.00 per foot. 401-348-8009. DOCK FOR RENT, Spyglass Harbor, The Moorings, Vero Beach. Price $8.50/ft. Boat over 40 ft long, non-liveaboard, electricity, water, hurricane safe, over 4ft draft at low tide. Email steve@embanet.com or call 407-628-1411. Dock space for rent Miami- great Intracoastal location minutes to ocean access. Liveaboard OK. Concrete piers, electric, water, cable, fuel station, pump out station, and marina lounge. Valet parking, showers, and laundry facilities available. $11 foot per ft. for annual contract. Please call (954) 962-5866 or email me at boazrosenblat@earthlink.net for further information.